Click the Online Now page to to see all the members and profiles currently online throughout the network. This includes some members online today if they are favorites, social network members or you have had chat sessions before. This allows you to send an IM chat message if they have signed off in the last few hours. Click Chat Online to see members available for chat right now. Click Last Chats to see all the members who you have made had chat activity with in the past. This is a good place to add favorites or follow up a member you would like yo know more about. Click Skype Online to see Skype members who are now available for chat or who are online. Have your Skype facility open to chat, phone or text. Use Report Abuse to report any member who is abusing the site or who may pose a threat to other members. From your Online Now and Chat Online pages you can access you favorites, matches and your e-mail centre to co-ordinate your messaging. .
Don't forget to checkout Capitol.fm from Bangkok, the worldwide internet radio station that is being developed for ThaiLoveLines members online! Send a range of flirt messages to any other members online. Tip a friend in need of a better love life about any member currently online or ask their opinion about the great people you are meeting on ThaiLoveLines. Add a member to your favorites list . Make a Date with another person online to chat again or to meet up if they are not available now to chat. Missed IM: If you IM a member and they are not available to chat or if they have just stepped offline, your missed IM message will be sent. Click Meet your Match to rate other members including new and old members with different options. In this way you can make your own matches online. Click My Matches to view your matches made by our system on a daily basis. We recommend that you bookmark this page in addition to your Members Control Centre and E-mail Centre (My Mailbox) as key parts of the ThaiLoveLines website. 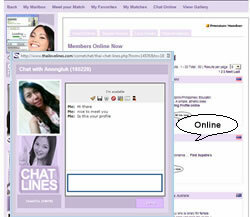 (Above) Click on the flashing baloon to begin a chat conversation with those online. Send Flirts, E-mails and add to favorites easily from here (Below) Click on Last Chats tab to recall your last chat partners. Click the Skype tab to view only members online with Skype accounts active.